This is a nice example of very early economic dynamics analyses, and also demonstrates implementation of discrete time notation in Vensim. 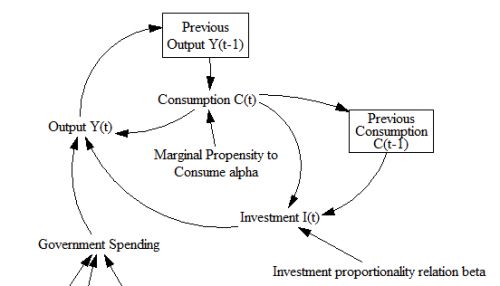 Low, Gilbert W. The Principle of Conservation and the Multiplier-Accelerator Theory of Business Cycles. Proceedings of the 1976 System Dynamics Conference. I’d love to have a copy of the Low model as a companion, if anyone is inclined to replicate it. See my blog post for more description of the model. The influence diagram shows that C(t)—–>C(t-1). Maybe weird, but not wrong, except to the extent that the whole model is wrong. What it implies is that the past value of C depends on (is a delay of) the present value of C.
Previous Previous post: How many things can you get wrong on one chart?